On the Murray State University campus in Kentucky, warm weather has arrived. Students are out on the quad skateboarding, riding bikes, playing Frisbee and listening to music. But what are they talking about? Basketball. 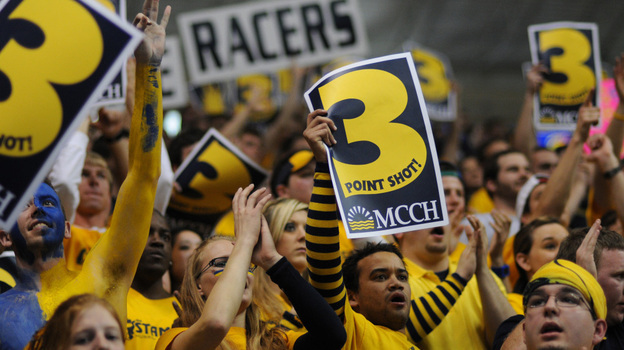 "I think Murray State can go to the Final Four," one student says. The MSU Racers have been in the tournament before, but with just a single loss this season and the highest tournament seed in the program's history, expectations are greater than ever. On Sunday, fans bolted out of their seats as Murray State's name came across the screen as a sixth seed during a NCAA Tournament Selection Show watch party. The atmosphere was so electric, senior guard Jewuan Long lost track of why he was watching in the first place. "I forgot all about what our ranking was and where we [were] playing. I was just excited," Long says. "So I had to ask people later on what we ranked and where we were playing at. It was just exciting." That excitement has been building all season, on campus and in the community. 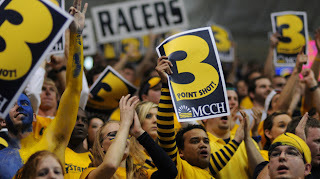 The Murray State Racers won their first 23 games and since January, every home game has sold out. Standing-room only crowds have filled the nearly 9,000-seat facility — that's more than half the town's population. Each week, a group of fans, former players and coaches gathers at a local restaurant to talk about the team. Sid Easley, an attorney and longtime Racer supporter, says the players are like heroes for the kids in town, especially the star point guard. "Isaiah Canaan has just become an icon for them, and the kids worship him, and that's the first time really that's ever happened," he says. Easley sits across from Racers legend Howie Crittenden, who played for Murray State in the 1950s. "Waitresses and all who I have teased about not wearing Murray State colors, now they're wearing Murray State colors while we're in the playoffs," Crittenden says with a laugh. Head coach Steve Prohm is counting on that support as the Racers first round game is in Louisville, just four hours east of Murray. "I hope we do have 7-, 8,000, 9,000 fans from Murray come over and support us," the coach says. Fans who aren't able to make the trip won't miss out. A large crowd is expected to gather on campus to watch a broadcast of the game, and students are planning parties of their own. Even businesses are joining in on the fun. Kelly Kennedy, a co-manager at Kroger supermarket, says they'll announce regular updates so shoppers won't miss out. "Just all throughout the game," Kennedy says. "Like every time that Murray State scores, or if it gets close, or if they get a big lead." Employers throughout the region are expecting a rash of people to call in sick on Thursday or take an extended lunch break. Some are even traveling to Louisville to watch the game against Colorado State to cheer on the team they hope goes all the way.